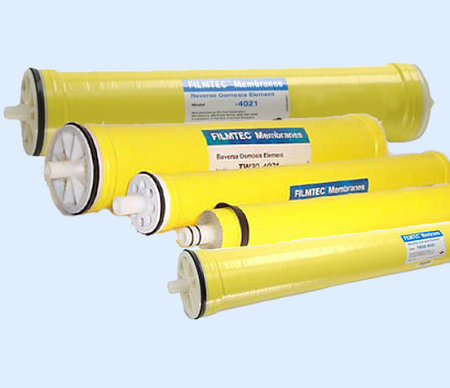 FILMTEC™ reverse osmosis (RO) elements are the globally recognized leader in separations technologies and solutions for industrial, municipal, commercial and consumer water applications. 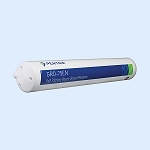 These elements offer high rejection of dissolved solids and organics and operate very efficiently at lower pressures. FILMTEC™ elements also provide excellent structural stability and are more productive than other elements. A complete range of FILMTEC™ elements are available to meet a wide variety of customer needs for commercial applications, from the highest purity water to the lowest total system costs. a Maximum temperature for continuous operation above pH 10 is 95°F (35°C). b Refer to Cleaning Guidelines in specification sheet 609-23010.
c Under certain conditions, the presence of free chlorine and other oxidizing agents will cause premature membrane failure. pretreatment prior to membrane exposure. Please refer to technical bulletin 609-22010 for more information. TW30-2013 100 2" X 13"
TW30-2026-DRY 220 2" X 26"
TW30-2514 170 2.5" X 14"
TW30-2521 300 2.5" X 21"
TW30-2540 660 2.5" X 40"
TW30-4014 480 4" X 14"